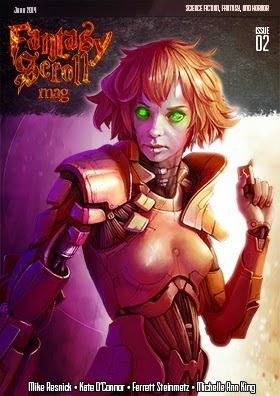 The second issue of Fantasy Scroll Magazine hit the interweb today, featuring a flash piece of mine called "The Unworthy." Along with my story, you'll find great stuff by Mike Resnick, Brandon Barrows, and many other fine folks. They also pack each issue with author interviews, book and movie reviews, and more. You can read the issue for free at the link above, but if you'd like to support the efforts of a brand new fantasy and science fiction magazine, you can purchase a copy for your mobile reader device of choice, or even set up a subscription. When I was a kid, I saw an HBO movie called Cast a Deadly Spell. At the end of this movie (spoiler alert, circa 1991), the bad guy summons this giant, Lovecraftian monster. This was long before I'd read anything by Lovecraft, so the homage was lost on me back then. But for some reason, I felt strangely sympathetic toward this bestial horror, even when it started eating people. I couldn't help but wonder what was going through this powerful entity's mind. It had presumably been minding its own business, then suddenly found itself on Earth with these odd little beings staring up at it in terror and awe. This thought was the seed that eventually sprouted into The Unworthy, decades later. If it sounds like it's up your alley, I hope you'll give it a read. If not, there's probably something else you'll enjoy in FSM. I'll definitely go get a copy! And I remember that movie well.